State government revenues in NH have grown more slowly over the past few years than almost every other state in New England and there aren’t any signs on the horizon that revenue will grow substantially over the next biennium. 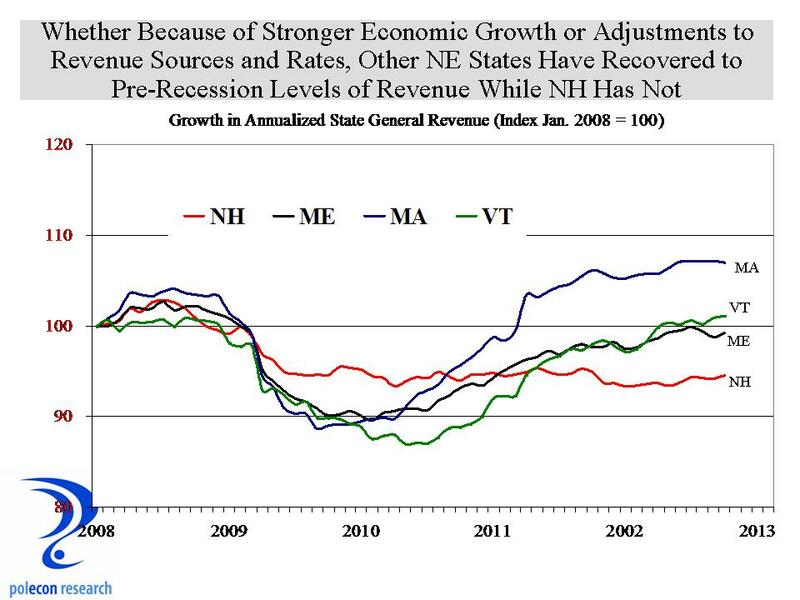 Some of that is the result of policy decisions that looked to reduce taxes in NH in order to increases economic growth, some is the result of other states willingness to expand or raise taxes, and some of it is the result of the fact that NH’s economy has been growing more slowly than most NE states with the exception of Rhodes Island and Maine. How much of the slow revenue growth is attributable to a weaker economy and how much is attributable to policy changes is difficult to discern. In some cases it is easy, the cigarette tax was reduced and produced less revenue (almost exactly the amount that I forecast) but more generally, slower growth (or declines) in revenues will occur in a weak economy regardless of policy changes. Even without a definitive answer to that question we can still learn something from the fiscal and economic experiences of NH and neighboring states over the past few years. Because it seems that it is all ideology all the time in public policy debates these days, lets filter the revenue and growth debate through the ideological prism that characterizes most legislative bodies and public debate today. For some in NH, it is bad enough that both Massachusetts and Vermont (that would be two-thirds of the Holy Trinity of New England socialism if socialists were allowed to believe in the Holy Trinity) have enjoyed stronger economic growth than NH over the past nearly two years. But it is even tougher to accept that each of these states can enjoy faster growth than NH at the same time they are seeing stronger growth in revenues, and maybe even at a time when they took steps to keep revenues from falling too far, because to ideologues on one side, more revenue has to mean slower economic growth and the only way to get stronger growth is to cut revenues. The other end of the political spectrum will argue that the collecting more revenue has allowed these states to invest in more of what their economies need to grow, but there hasn’t been a whole lot of “investing” by state and local governments anywhere in recent years and each of these states has taken some steps to reduce the size and scope of state government expenditures in recent years. The reality of course, as it almost always is, is somewhere in that wasteland (according to ideologues) known as “the middle”. The stronger revenue growth of some states is largely a function of stronger economic growth and not necessarily the “investments” those revenues allowed but it can also be said that their generally higher levels of taxation have not disadvantaged their economic performance in relation to NH with its lower level of taxation. 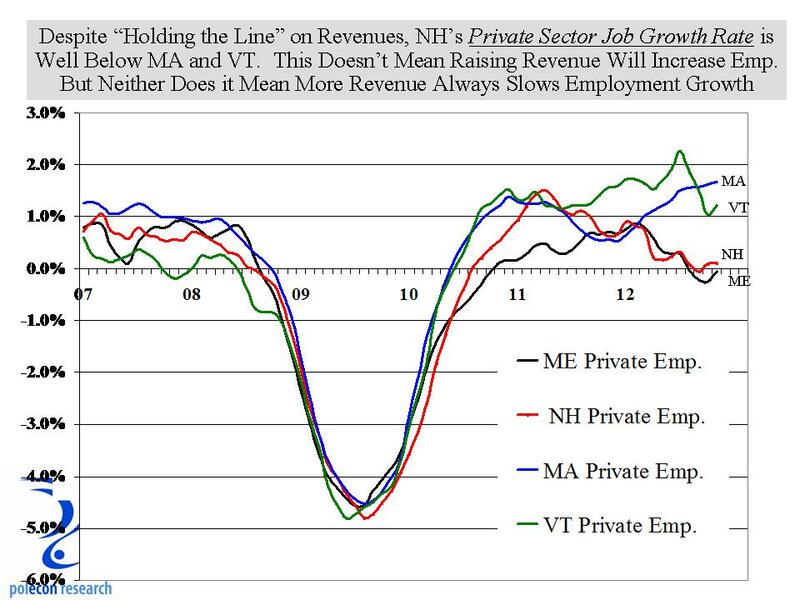 Some of NH’s slow revenue growth is the result of policy decisions but most is related to an economy growing more slowly than neighboring states. If there is anything to learn from recent economic and revenue trends it is that taking less in revenue does not, in itself, guarantee stronger growth and that more revenue doesn’t always stifle (although it could) economic growth. I know business taxes in NH remain high, but that has been true for as long as almost anyone can remember. It didn’t keep NH from growing faster than any other state in the region for most of 30 years so I doubt it is the singular reason why we are growing more slowly now. That doesn’t mean it isn’t an issue that should be addressed, it just means that its not likely the only answer to NH’s problem of slower economic growth. For all of us non-ideologues, I hope lawmakers look to broaden the range of issues in the policy debates over how best to strengthen NH’s economy. This entry was posted on January 11, 2013 at 1:01 pm and is filed under Fiscal Policy, New Hampshire, Tax Revenue. You can subscribe via RSS 2.0 feed to this post's comments.